/ How Far Can a Piano Fly? How Far Can a Piano Fly? Paperback, 339 pages, 9.1" x 6.6". 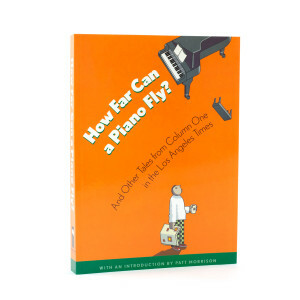 In "How Far Can a Piano Fly? And Other Tales From Column One in the Los Angeles Times," editors of the paper have selected nearly 50 of these articles to showcase the range of stories that have appeared in this space. Included are profiles, of people both well known and unknown, that offer insight into human nature and motivation. Reporters write from abroad-and from nearby-of special people, places and events that often escape immediate notice. And you'll find quite a few wild and wacky yarns-including one about men whose dreams are of making pianos fly.